Amber C. Haines is a soulful writer and a blogger at TheRunaMuck.com. She is curator, with her husband, Seth, of Mother Letters and is a contributor with many acclaimed writers and bloggers at DaySpring’s (in)courage. She has been involved as a coordinator with both BlissDom and !dea Camp Orphan Care and continues to build meaningful relationships with church leaders, lifestyle bloggers, authors, advocates, and poets. She lives in Arkansas. 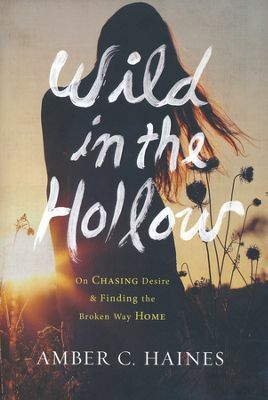 Wild in the Hollows by Amber C. Haines is not a “feel good” book, it’s not for the weak-hearted or the prim and proper. It’s a power punch of a story. The tale of one woman’s journey from shame to grace and all of the places in between. It’s raw and divulging – exposing the realness of life, all written within a prose carefully and magnificently orchestrated. “Our systemized theology was our way to harness the wind, to get some reins on the Holy Spirit so we could manipulate him to the left or the right. Our systemized theology was a way to fit, to assimilate, and that was my desire – to fit into a people. But there was never anything so exhausting as that, as acting like we could control God, as trying to fit into a people who believed that they could control God. I was running out of energy, looking to fill the empty hollow again. Too self-aware and anemic, I let go of the reins. Isn’t it sometimes God’s mercy that we crash?” (pg. 58). Amber C. Haines speaks of a life where she exchanged religious rules for the love of her Savior. It is beautifully written. I received this book from Revell Reads in exchange for my honest opinion which I’ve provided here.